I just got home from an unbelievably amazing weekend in Charleston, SC (more details to come!). 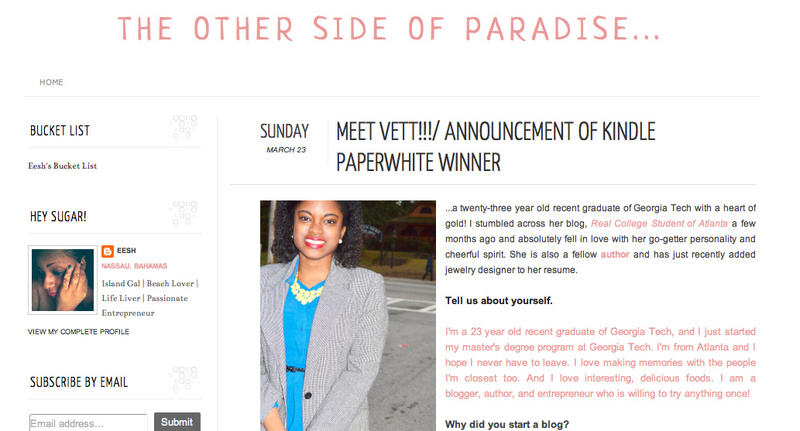 But I wanted to share a blog post feature that fellow blogger, Eesh, from The Other Side of Paradise did on me. She is super sweet and I really enjoy her blog. So I was honored that she asked to share my story and my recent jewelry design with her followers. Thanks, Eesh! Check out the post here and let me know what you think! It was my pleasure! I really admire you & your life's story so far has been inspiring. I LOVE the article she wrote about you! Hope you had an amazing weekend! Congratulations on the feature Vett! Glad you had a great weekend girl. What a great article Vett! Congrats again! Thats so exciting! I love the article she wrote about you!